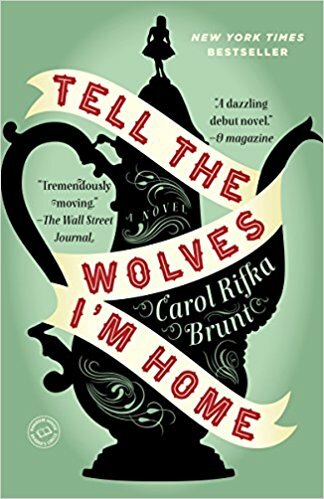 In a heartbreaking, sentimental tale of adolescence, author Carol Rifka Brunt captures the inner-turmoil of fourteen-year-old June Elbus as she copes with the loss of her uncle in Brunt’s debut novel, Tell the Wolves I’m Home. This coming-of-age novel deals with themes of grief and acceptance as June navigates the world without her best friend after her uncle passes away from AIDS in 1980’s New York. Uncle Finn was the only one to understand June, introducing her to a world of art, Renaissance fairs, and Mozart’s Requiem. To June, Finn was a special red tea kettle and her favorite pair of boots. After spending most of her life falling second to her sister, June always looked forward to being Finn’s number one. However, when a strange English man appears at her uncle’s funeral, she realizes she isn’t the only important person in her uncle’s life. There was a whole other half of his world that she never got to be a part of and soon jealousy takes hold of June, quickly turning into resentment as she begins to question everything she knows about her uncle. As the book progresses, she opens herself up to Toby, her uncle’s partner whom she meets in secret, and learns more about his life as they both come to terms with Finn’s death. They reminisce on all things Finn and June eventually stops seeing Toby as the man who killed her uncle. At the same time, June struggles to save her tumultuous relationship with her sister and family who resent Finn’s life choices and refuse to acknowledge Toby’s existence. This book will make you ugly-cry in a good, cathartic way. Tell the Wolves I’m Home opens reader’s eyes to the heartbreak and sorrow of AIDS, the stigma of homosexuality in the 1980’s, and the struggle we face when family members leave us behind.